Kloden could have had a very different sporting career altogether having been a budding gymnast in his youth. But that path changed courtesy of his neighbours, who were related to a former East German track legend, and got the then 11-year-old into cycling. Eighteen years later, his decision was dramatically rewarded when he finished second in the Tour de France. As a result of his efforts, in which his time trialling snuck him that spot, the pressure will be on in 2005. A year ago as the peloton geared up for cycling's premier event, Kloden was talked of simply as the team-mate, albeit a talented one, of Jan Ullrich. 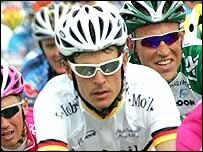 But when Ullrich struggled in the Pyrenees, Kloden took over from his close friend as team leader in the race. His time trialling and mountain climbing are undoubtedly his greatest assets. But in terms of a negative, if Ullrich is firing he may be forced to revert to the role of chief lieutenant once again. Added to that, he has had a dire season to date and has been virtually invisible in the build-up races, although his past experience suggests he will be a threat.